Maybe Inglourious Basterds is a good movie. Maybe it is not. In any case I have hardly seen any other movie being misspelled so often. That’s at least one achievement. “And the Oscar for most misspelled movie goes to…. “. Inglourious Basterds is in many ways a typical Tarantino. If you don’t like Tarantino, you will probably not like this. It has graphic elements and there are a few moments of shooting gone wild like in any Tarantino. The score is also very Tarantino, although toned down. 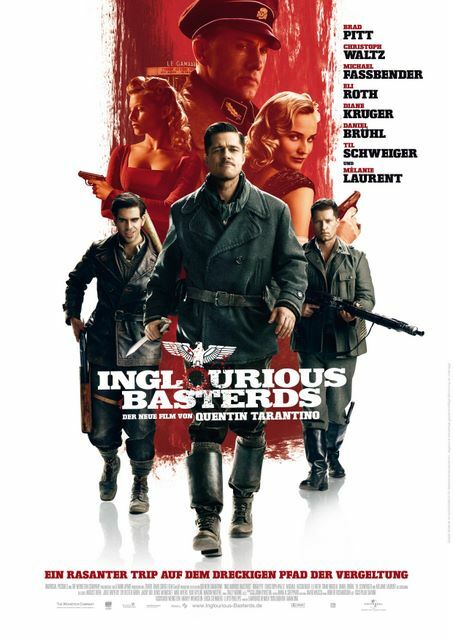 The main story of Inglourious Basterds is a retelling of the end of WWII. It’s purely fictionalized and far from historically accurate. We have different story lines that are all interwoven. The Basterds are a group of American soldiers led by Lt Aldo Raine (Brad Pitt), many of them of Jewish or German origin. They are dropped in Nazi-occupied France to hunt and kill Germans. They either club them to death or take their scalps. Brad Pitt is extremely good in the role of Tennessee-born tough-guy Raine who shows no mercy when it comes to Nazis. Another story line starts with “the Jew hunter” Col Landa (Christoph Waltz) whom we meet when he is exterminating a family of Jews. One of the daughters, Shosanna (Mélanie Laurent) manages to escape. Landa is maybe one of the most annoying film characters ever. The different story lines come together when Fredrick Zoller (Daniel Brühl), a German war hero, meets Shosanna aka Emanuelle in Paris where she meanwhile owns a cinema. He plays himself in a movie about his exploits that has been financed by Goebbels. He tries to convince Shosanna to have the opening in her cinema. It will be an event that the whole of the German high command, including Hitler, will attend. Many people hear of this event, among them the Basterds. This unique opportunity to have the most important Germans together in one location for an evening gives more than just one group ideas. At the end all the different storylines come together for an ultimate typically Tarantino finale. As far as war movies go, this was quite entertaining but not exactly my thing. As far as Tarantino movies go, it could be one of his best. I did like a few elements but was surprised that there are so many scenes that come across like theater scenes and found them actually very boring. Despite the boring elements, it offers strong pictures, some really good ideas and the genre blend is interesting. It is not a movie I liked but I would highly recommend it as it is an original addition to the genre. Tarantino fans will watch it anyway, I guess. There is one thing I really enjoyed and that is how accents were handled. One of the rare movies in which this was handled with perfection. Most of the German actors (they are all internationally acclaimed), are either bilingual or very strong in English which was an asset. This entry was posted in Actors, Movie, Reviews, Trailer, War Movie, WWII and tagged Brad Pitt, Christoph Waltz, Daniel Brühl, Diane Kruger, Ingloorious Basterds, Mélanie Laurent, Michael Fassbender, Movie Trailer, Movies, Quentin Tarantino, Reviews, Till Schweiger, War Movies, WWII. I loved this movie, and I’m not much of a Tarantino fan. I thought the acting was excellent, and I liked that the actors spoke their native languages. I remember not liking Valkyrie as much because they were American or British actors playing Germans with American and British accents. The cast is absolutely excellent and well chosen. One of the best I’ve seen. The movie is very special and certainly worth watching. It just didn’t move me, I liked it on a more intellectual level. I can’t remember the language part in Vaklyrie but I liked the movie a lot. I have to admit I resisted seeing it because I do not like “what if” movies, but my son forced me to go and I liked it. Your review is spot on. There are some great set pieces, especially in the basement bar. The actress that plays Shoshanna (Melanie Laurent) is great and Waltz was one of the most lopsided victors in a Supporting Actor race ever. There is something to be said about a movie where Brad Pitt gives at best the third best performance. BTW I would describe Landa as charmingly malevolent instead of annoying. Mélanie Laurent is quite the shooting star of French cinema. I’ve seen her a few times recently and she is a good actress. Landa did annoy me incredibly. When he is eating that Strudel… Gross. I’m not in favour of the bar scene, I found it boring. It goes on and on. I was astonished by the guy who plays Hitler. I think he is the one of all the actors I’ve seen so far who sounded the most like Hitler himself. I’ll have to watch Der Untergang again but right now I would say not even Bruno Ganz was that good. I couldn’t even say which was the actor I thought best. Even Till Schweiger and MIchael Fassbender were great. I’m glad I watched it. I tried before and stopped after the head-clubbing scene. The strudel scene was Tarantino being Tarantino, you can’t blame it on Landa. I will stick with Ganz. Moe of the 3 Stooges also did a great Hitler. One thing about the bar scene that marred it was the idea that those drunken Germans would have reacted so quickly to the initial shots that they could have taken out all of the Basterds (who would have been ready in case something broke out). I guess I am not supposed to think about stuff like that. Landa is Tarantino’s invention and it is an annoying invention. I didn’t get your second point and why you should not think about it? On the second point, they are seated at the table with the Nazi with guns pointed at each other under the table. The Germans at the other table are drunk and unaware of the verbal confrontation taking place and yet when the shooting starts, the drunk Germans quickly pull weapons and manage to kill all the good guys and wound the actress before they are killed (except the new father). That is very unreasonable. I meant that in a Tarantino film it is best not to think of whether something was plausible. I get you. Yes, I agree and – as you say – Tarantino isn’t so much about plausibility. He has his own visual language and either one likes it or not. I too put off seeing this film due to it’s straying from history – plus the Tarantino violence. But armed with a partner who could tell me when to look away I watched it and loved it. Enjoyed his playfulness with the genre. I watch mainly forties films and wonder weather realism is a fairly new feature of the war genre. (well, anything post 45 is new to me!) so I didn’t mind implausibilities at all. Tarantino makes genre films so he plays by their conventions. (the same way martial arts film rules mean that Uma can only ever be attacked by one person at a time in Kill Bill) I loved the death of Hitler. It reminded me of the wartime Bugs Bunny and Popeye films. I can imagine an audience cheering! Those graphic scenes put me off the first time I tried to watch it. By Tarantino standards it isn’t too violent. I’m not sure about realism being a new feature. I think there were always attempts, I’m thinking of All Quiet on the Western Front and some others. I will have to watch Kill Bill again, I didn’t notice her only being attacked by one person at a time but now that you mention it, I think I remember. Tarantino’s movie take a lot of decoding efforts. Ladies, every martial arts film I have ever seen has the hero having to deal with one attacker at a time. How long would Bruce Lee’s character last if the ten bad guys just all rushed him at the same time? I suppose he could duck and they could all bang their heads together, but that would not be very entertaining. Tarantino certainly did not invent this. I’m no film historian, but I would say we could trace this type of graphic violence back to “Bonnie and Clyde” in 1967. Of course, that movie was tame by today’s “standards”, but it opened the flood gates. That’s actually what Curvy Kitty said. She wrote that Tarantino took that from the martial arts movies. I’m the one who has no clue when it comes to Martial arts movies. I’m more of a Brandon Lee than a Bruce Lee person. Re realism – I’m a 40s girl. I’ve watched a lot of propaganda! I don’t think I did or don’t remember or worse… didn’t get it. I have read your review days ago but kept forgetting to say something. When I saw the trailer…I wanted to see it…but Brad Pitt sort of put me down. If only there was no Pitt, I had watched this since last year. Thanks, Novroz. He is better in this movie than in most others. I really didn’t mind him. I’m not his fan normally.